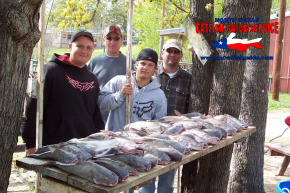 We get a lot of questions on our guided catfish fishing trips with North Texas Catfish Guide Service about chumming for catfish or “baiting a catfish hole” as a lot of people like to call it and whether it is an effective way to catch catfish. Using chum, or chumming for catfish is something that we do on our North Texas Catfish Guide Service guided catfish fishing trips at times when we target channel catfish. Channel Catfish in general are considered to be scavenger fish, and blue catfish in general are considered to be predator fish and scavenger fish. The channel catfish lives on a diet of whatever it can find to eat, and know to bite anything from a dead minnow, to a piece of bait soap or a hot dog, to homemade or commercially prepared “stink” baits or “punch” baits. The “scavenge” the bottom of the lake looking for anything and everything to eat. While the blue catfish does spend some of its existence feeding on items like the channel catfish, and blue catfish can be caught on items like catfish bait soap and stink baits, the primary difference between the blue catfish diet is that the blue catfish primarily feeds on shad. The follow the schools of shad and bait fish all year long and forage on these fish on a regular basis. In our opinion the bigger the catfish, the more likely they are to live on a diet of live or dead bait fish and shad. If your interested in “baiting a hole for catfish” or chumming for catfish then you need to remember a few things. When your baiting a hole for catfish, or chumming, you will primarily catch channel catfish, and most of the fish will be between one and three pounds, with a some larger catfish mixed in, depending on the lake that your fishing for catfish in. Does this mean that if you “bait a hole for catfish” or chum that you will not catch blue catfish? NO, it does not, because there is likelihood that you will catch some blue catfish here and there when you chum, but the catfish will primarily be channel catfish and the blue catfish that you catch will typically be 1-5 pound blue catfish as well. Does this mean that you will never catch a Trophy Catfish when fishing a baited hole or chumming an area? NO, because it does happen from time to time, but if your out to specifically target Trophy Blue Catfish like we do on our guided catfish fishing trips at North Texas Catfish Guide Service then chumming for catfish or “baiting a hole” is not the way to do so. If your primary objective is to get out and catch a lot of catfish that are “box” fish or keeper sized for a fish fry or just simply for the means of catching a lot of fish, then chumming may very well be an effective means for you to do so. 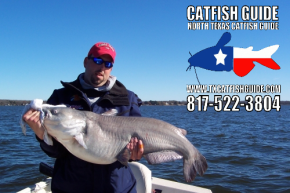 We perfectly understand on our guided catfish fishing trips with North Texas Catfish Guide Service that some people want to catch a handful of really big blue catfish, and others would prefer to catch a whole bunch or “keeper” sized fish or “box” fish. Now, with all this in mind, let’s talk about “baiting a hole” for catfish, or chumming for catfish, how to do it, what to use, and how to fish in these areas, and explain the difference between “baiting a catfish fishing hole” and chumming. First and foremost is the “chum” that you will use. Many catfish anglers will have different opinions on what the “best” thing to use for catfish chum is. Many different options are available with the most common being wheat, milo, hen scratch, range cubes and cottonseed cakes. Cottonseed cakes were the item most used for a “baiting a hole for catfish” (chumming) for many years, and then people stopped using them because lack of availability. There are very few feed mills in the United States that still manufacture cottonseed cakes, and they are very hard to come by. The feed mills have started producing a product called ranges cubes, which is a smaller version of the cottonseed cake. The range cubes are used to feed cattle and are available at any feed store. Cottonseed cake is without a doubt better than the range cubes because they contain much more oil than the range cubes do, which seems to help with attracting channel catfish, but again, being able to find the cottonseed cake will likely be extremely difficult. If you can actually find the cottonseed cakes, they typically cost between $7 and $8 each. We typically use one entire cake in each hole we are baiting (chumming) for channel catfish when using cottonseed cakes. Range cubes come in fifty pound bags and will cost about $5 to $6 a bag and one fifty pound bag will bait about 6-8 areas. (Typically about 1 gallon to 1.5 gallons of range cubes per hole for chumming). When purchasing range cubes you can get these at any feed store and you want to make sure that you purchase the 20% range cubes. (Just go in the feed store and ask for 20% range cubes they will know what you’re talking about. The range cubes are beneficial for those that have weak stomachs and cannot handle the strong smells from soured grain chum, those that do not want the soured grains in their boats, and those that are fishing on short notice and do not have time to prepare soured milo or soured wheat for catfish chum. The next option is using soured grain for catfish chum. Soured grain would encompass milo, wheat and hen scratch. Make no mistake; the chum you will make out of any of these soured grains will STINK. You need to be prepared for the smell that will arise from the fermenting grain in a few weeks, because it will be obvious, and you need to be prepared for the smell when you take the grain out on the lake to chum for catfish or bait your catfish hole. Some people simply cannot stand the smell of the soured grain. Milo is most commonly found in Texas. 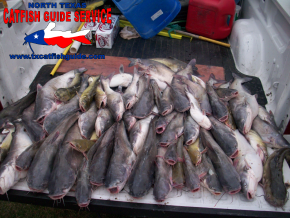 I have received feedback from my clients of North Texas Catfish Guide Service on our guided catfish fishing trips that live outside of Texas that have told me that Milo is not available in their area, but it is available in many areas. Milo is also called grain sorghum in some areas. Milo (grain sorghum) is grown in the hot dry plains of Texas where corn will not grow. Grain Sorghum is a food grain for humans, but in the United States it is primarily used as a food for livestock. The Milo (grain sorghum) is cracked or rolled and fed to livestock in place of corn. Milo (grain sorghum) will come in 50 Pound Bags and will cost about $5-$7 a bag. One thing to remember about making purchases from a Feed Store is that all of these items will be cheaper in the country than they will in the city. If you go to a feed store in a major metropolitan city they typically charge 25% or more higher prices than the feed stores in the country or in areas that sell high volumes of feed do. Wheat is the next option. Wheat (most commonly called cracked wheat in feed stores). Wheat is available in 50 Lb bags and will cost anywhere from $5-$7 per bag. It is pretty self explanatory as to what it is so I will not go into it. Wheat does seem to be very regional in nature as well and I have again received many reports outside of Texas that wheat is not available. I cannot understand why and truly believe that this has more to do with ignorance on behalf of the feed store owners. The final consideration is Hen Scratch. Hen scratch is typically available all across the United States. Hen Scratch is used to feed chickens and contains a blend of corn, milo and wheat. Now you’re probably asking, with all of these choices what should I use for my catfish chum? Well, you have to make your own decision as to whether or not you can handle the smell of soured grain, and assess your options available to you locally. If your fishing with North Texas Catfish Guide Service on one of our guided catfish fishing trips for channel catfish, and we are using soured grain for catfish chum or fishing a baited hole, we will typically use cottonseed cakes if they are available (or range cubes if not) and soured wheat for chumming for catfish. If cottonseed cakes are not available, range cubes are an effective option. They range cubes are definitely not as effective as cottonseed cakes, but they are indeed effective. Wheat is our primary choice for soured grains on our guided catfish fishing trips, but if wheat is not available, milo is a close runner for second place as an effective catfish chum. Hen scratch would be my very last choice for catfish chum on our catfish guide trips because it contains corn, which takes longer to ferment and fills the fish up faster..
Now again, this (chumming for catfish or “baiting a hole”) is not something we do on a regular basis, and it is typically isolated to certain lakes we fish on our guided catfish fishing trips, and certain time of the year. Our preference is to fish for blue catfish with fresh caught bait on our guided catfish fishing trips. Like we said, if your after huge catfish, or blue catfish, this is not an effective way to catch catfish, but if you wanting to catch some channel catfish and a few blue catfish mixed in here and there, then chumming or baiting a hole is a good option. If your using the range cubes or cottonseed cakes there is no preparation involved, but if your using the milo, wheat or hen scratch then there will be some preparation involved in getting your catfish chum ready. The first step is going to be to get several (three or four) plastic 5 gallon buckets. These can be obtained just about anywhere, and you will need lids for these 5 gallon buckets, and preferably lids that snap on tight and seal the bucket of catfish chum very well. Take your plastic buckets (make sure they are clean) and set them out. Take your bag of grain (milo, wheat or hen scratch) and fill each of your plastic buckets a little less than three quarters of the way full with grain. Once you have filled the buckets with grain, then you should fill them with water within about two to three inches of the top of the bucket. You want to make sure you add plenty of water because the grain will begin to absorb water very quickly. After adding the grain and water for your catfish chum, you will want to pour in about ½ of a 12 ounce can of beer and a few tablespoons of sugar. This will help jump start the fermentation process of your catfish chum and get it ready a little more quickly. When all of your ingredients in your catfish chum have been added, then you should place the lids on the tops of the buckets. DO NOT snap the lids on or seal them, because when the fermentation begins, the grains will put off gases. The gas needs to be able to escape, or otherwise your bucket will blow up, and blow soured grain catfish chum all over everything around it. Leave the lid loose on the buckets for several days until the soured grain catfish chum stops bubbling. You will need to check on the grain every few days and add water to it as needed as the grain absorbs the water. Once the rain has absorbed the water initially then you simply need to keep the water one to two inches above the top of the grain. In Texas during the Summer when it is 100 degrees outside the grain will be fermented and ready to use as catfish chum in just a few days. If your making your catfish chum during the cooler months, you should allow one to two weeks for the grain to ferment. Most people will sour grain in a 5 gallon plastic bucket with a snap on lid so when the grain has finished fermenting they can snap the lid in the bucket of catfish chum and seal in the smell as much as possible. If your doing a lot of fishing and using a lot of soured grain catfish chum you should consider souring your wheat or milo in a 55 gallon drum or trash can and adding grain as necessary. Just make sure that the top is covered because failing to do so will cause maggots to grow in your catfish chum. Another thing to consider about using your soured grain catfish chum is when you get to the end of the bucket, leave an inch or two of the fermented grain in the bottom of the bucket. This will “jump start” the next batch of grain that you sour and will allow it to ferment much more quickly. Now, on to chumming for catfish or baiting a hole. Chumming and Baiting a Hole are actually two very different things. Chumming for catfish is the practice of throwing out soured grain, range cubes, cottonseed cake or whatever your choice is of catfish chum, right before or a short time before you start fishing for catfish. Baiting a Hole is typically considered a more long term endeavor where you choose a location and chum the area for catfish with your soured grain or range cubes on a regularly scheduled basis to draw the catfish into the area and keep them in the area. There is no doubt that “baiting a hole” is beneficial if your someone who will be fishing for channel catfish on a regular basis. For the purpose of this article, the process of throwing the grain or range cubes out stays the same. The only difference is if you were baiting a hole or chumming an area on a regular basis you would go to the exact same area and throw out your soured grain catfish chum or range cubes several times a week or more. Many lakes in Texas have areas that are “community” fishing holes that are constantly baited with soured grain or range cubes on a regular basis by the anglers who fish these areas which keeps the channel catfish in the area all the time. These areas are typically marked with large landmarks like bulkheads or bridges, or they are in areas where anglers have set some sort of permanent buoy marker in the area and everyone throws soured grain or range cubes in the area when they fish. So the first thing you need to consider about chumming for catfish or baiting a hole for catfish with soured grain is transporting the soured grain catfish chum to the lake or river. You have not lived until you have had a bucket of stinking rotten soured grain catfish chum turn over and spill in your boat or truck. I can speak from experience that it is not something that you want to go through. The best mode of transportation and storage I have found is a 3 Gallon Plastic Bucket. These can be purchased at a home supply store with a lid for a few dollars. Go ahead and shell out the $3 for a new bucket so you will be assured the lid has a good seal on it and won’t leak. 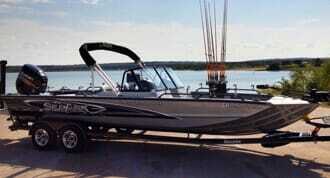 The 3 gallon bucket takes up less room in a boat and also cuts down on weight in the boat as well. You are not likely to need 5 gallons of soured grain in a single day or nights catfish fishing trip. Again when you put the grain in the 3 gallon bucket to transport to the lake or river, MAKE SURE THE LID IS SEALED AND THE BUCKET IS SECURE. Once you get to the lake you need to determine where your going to fish for catfish. I will not divulge specific locations or areas you should look for but I can tell you that from my experience I have found chumming for catfish or baiting a hole for catfish to be most effective in shallower water. I would not consider chumming for catfish or baiting a hole for catfish in water over about 20 feet deep, and even that would be really deep for my typical style of fishing for channel catfish. Get to your area that you have determined that you will be fishing for channel catfish and open up your bucket of soured grain catfish chum or your range cubes. If your using range cubes you can throw them around by hand, but if using soured grain you will want to use a scoop, coffee can or something to that effect to keep the grain off your hand. I prefer a plastic dog food scoop for the soured grain because I can scoop the grain out of the bucket without getting the grain on my hands. You want to throw out about ¼ gallon of soured grain if using soured grain for your catfish chum. If using range cubes then 4-5 large handfuls of range cubes will work. Just remember, all your trying to do is “fire up” the catfish bite and concentrate the catfish into an area. If you use too much catfish chum you will simply feed the catfish and they will not be interested in your offerings. When you throw out the soured grain or range cubes, don’t just toss them over the side of the boat. You want to throw your catfish chum out in a fashion that would be similar to feeding chickens. Spread the catfish chum out over the area and make the channel catfish work for it to look for it. The whole idea is to draw them in with the scent and keep them on the move. Typically channel catfish anglers will “chum” several areas for channel catfish when they get on the water. Picking four or five areas to throw their catfish chum. These areas may often be 100 yards apart of less but having several areas definitely increases your odds of catching more catfish. When you chum your area, you want to make particular note of where you have thrown your catfish chum, either by using a landmark, marking it with a buoy, marking it on GPS, or working from memory. The problem with using landmarks or working from memory is when you start fishing for catfish, you want to make sure you fish in the exact area that you threw your grain, and after it gets dark or you have chummed several different areas for channel catfish, they all begin to run together and look the same. Marker buoy’s work great, but they also broadcast to everyone else out there that is a fishing area. My preferred method for marking areas on my guided catfish fishing trips is to mark the area with a GPS unit that way I have accurate information on my catfish fishing area and know I am in the right place. Use your catfish chum in several different areas and mark each one. Go back to the first areas where you have thrown your catfish chum, anchor back away from it and start fishing. Typically your catfish chum will draw in channel catfish in a very short period of time. I have had the catfish chum be effective in as short as a few minutes, and have also had it take as long as thirty minutes as well. When you chum for catfish, it is a good idea to target different depths and different structure and cover so you can cover several different areas for your chumming and increase your chances of catching more channel catfish. As a general rule, I will not fish an area for more than 10 minutes without getting bites, which is probably a little less time than most people will allow, but on my guided catfish fishing trips I want to make sure my customers catch catfish so I eliminate as much of the “sit and wait”: as possible. I would never sit in an area for longer than 30 minutes without a bite. Once you have fished the first area where you have thrown your catfish chum, if you don’t get bites or catch catfish, throw out some more of your soured grain catfish chum or range cubes catfish chum and move to your second spot. You can come back to the area and fish again later if needed. If you do start catching catfish then keep fishing until the bite slows down. When the bite slows down, throw out a small amount of more soured grain and keep fishing until the catfish stop biting. When they stop biting, throw out some more grain and move, you may be able to come back to this area later. Once you have fished all of your areas, you can work your way back through the areas you have chummed for catfish and fish them again if needed, but you very well may have a limit of catfish the first time around. Now that you know how to prepare your catfish chum, how to chum for catfish, how to bait a hole for catfish, and the different areas that you should use your catfish chum, you should pretty much know all there is to know about chumming for catfish. The next step is to consider your equipment for catfishing and your catfish bait for catching channel catfish. Fishing equipment for catching channel catfish as a general rule is much different than the equipment we use for catching blue catfish and trophy blue catfish on our guided catfish fishing trips. Channel catfish will generally average 1-3 pounds in size so the tackle and equipment can be much lighter, plus the channel catfish bite is much lighter than that of a blue catfish. When a blue catfish hits there is no doubt about it, but channel catfish are often described as “mealy mouthing” the catfish bait or sucking on it and playing with it, often without the knowledge of the person holding the fishing rod. Let’s start with catfish bait for fishing in chummed areas for channel catfish. I can say hands down without a doubt the absolute best bait for fishing in chummed areas or a grained hole is Sure Shot Catfish Punch Bait. 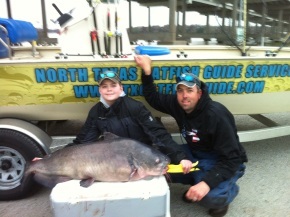 Catfish Baits and very regional in nature and “Punch Bait” seems to be a term that is regional to Texas and Oklahoma. The difference between a “punch bait” and a dip bait is very simple. Dip baits, which are common throughout the United States for channel catfish, are very runny and require a sponge or dip worm to keep the catfish bait on the hook. Dip baits are an effective catfish bait for man catfish anglers but I find them to be messy and difficult to fish with. Having to use sponges, dip worms and other items to keep the catfish bait on the hook, plus the fact that the bait does not stay on the dip worm or sponge for more than a couple of minutes, makes these dip baits far to difficult in my opinion. Catfish Punch Baits are much thicker than dip baits and will stick on a plain treble hook, and do not require a dip worm or sponge to keep the catfish bait on the hook. These “punch baits” get their name because you take the treble hook and “punch” the hook into the bait with a stick and then pull the treble hook out by the fishing line and the bait sticks on the hook. Punch baits, just like dip baits are primarily made of cheese. There are many of these baits on the market, some are good, and some are not. I cannot attest to the effectiveness of many of them, because there are only a handful that I use, but the one catfish punch bait that I do use and has always produced consistent results for channel catfish on our guided catfish fishing trips has been Sure Shot Catfish Punch Bait. Sure Shot Catfish Punch bait is a homemade catfish punch bait made in Decatur Texas by my good friend Benny Roberts. Benny’s Sure Shot Catfish Punch Bait is made from cheese and various other secret ingredients. It is simple to use and will flat out catch catfish. Catfish Punch Baits can be fished with a treble hook on a slip sinker rig or underneath a slip cork either one. This is simply a matter of personal preference as to which you choose. If you’re out to catch a nice mess of channel catfish, then chumming for catfish or baiting a hole for catfish would be a good option for you to explore. More information on chumming for catfish, baiting a hole for catfish and making catfish chum can be found on the Learn To Catch Catfish website. Take the tools and information that we have given you and give it a try on your next catfish fishing trip, or if you want to see firsthand how to catch catfish, contact North Texas Catfish Guide Service at 817-522-3804 for a guided catfishing trip on Eagle Mountain Lake, Lake Lewisville, Lake Worth or one of the other lakes we fish.